A subdomain is a lower level domain. It is added on the left of the domain name, e.g. subdomain.example.com. You can create as many subdomains as allowed by the plan. Domains and subdomains have equal functional capabilities, including web site management, e-mail service, FTP, dedicated IPs, etc., but subdomains do not have their own DNS zones and usually cost less. Go to Domain Settings > Domain Info. 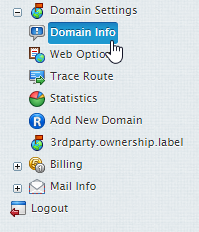 Select the Edit icon for the domain you wish to add a sub-domain to. Click the Add Button in the Sub Domains section. Within the text box, input the name you wish to use for the sub domain and click the Create subdomain button. That’s it. Your sub domain will be displayed under your domain.